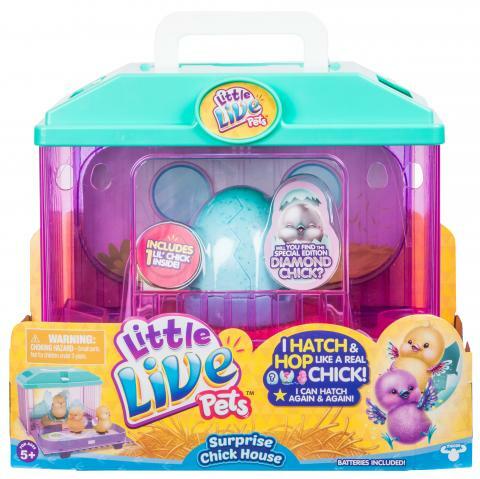 Easy to understand video showing how to operate your hatching baby chick toy and best buys on Little Live Pets toys and chicken toys for kids. Easy to operate and fun to watch. Turn baby chick to "On"
This video shows exactly how to get your toy baby chick to hatch over and over again, how to turn it off and on and watch as the baby chick hops around if left on a flat surface, call to you if you have not played with it in awhile, and chirp out a cute little song if you pet it. Too cute for words...a must see. Who will hatch out of your egg? Little Live Pets Baby Chicks are about to say hello! You'll be attached to it as soon as it hatches! This Lil' Chick comes with a cute little Chicken house where they sleep and eat! Get ready, the fun is about to hatch! Watch The Shy Little Chick Come Out Of Their Shell! Pet Your Chick And Hear It Chirp! Scroll down to see best buys on Little Live Pets toys and Chicken Toys and games for kids. In our Baby Chick Index you will find out how to hatch your own live baby chicks, how to take the best care of them, how a baby chick develops inside a hen, and what to do if something goes wrong. Go to Baby Chick Index to find out more.